Chiang Mai is essentially Thailand's second city - the smaller, more relaxed answer to the madness of Bangkok. It was once the capital of the Lanna Kingdom, but now is a major draw for backpackers and travelers of all kinds, not to mention retiring ex-pats and humanitarians. Many who come here return again and again, or stay for years when they had meant to stay only a few weeks. There's an energy in the city that captivates those who visit, whether they seek a trekking adventure or a spiritual awakening as they travel from temple to temple. Wat Chedi Luang(Temple of the Big Stupa) is an impressive ruined temple in the center of Chiang Mai, is home to Chiang Mai’s largest Buddhist chedi built featuring 98 meters tall and 54 meters in diameter. The construction of the orginal chedi was completed in 1481 during the reign of King Mengrai. 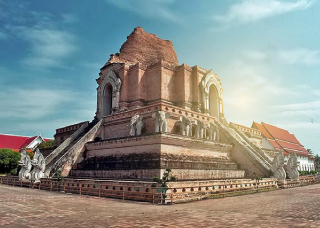 But the current Chedi Luang is an restoration according to the deconstruction of the chedi in 1545 due to an earthquake. The ordination hall located in the front is also an example of beautiful Lanna architecture with its serpents are probably one of the most remembered elements. Chiang Mai's oldest temple was established by the city's founder, Phaya Mengrai, sometime around 1296. In front of the ubosot, a stone slab, engraved in 158, bears the earliest known reference to the city's founding. The main wí·hăhn also contains the oldest known Buddha image created by the Lanna kingdom, cast in 1465. A smaller second wí·hăhn enshrines the city's guardian images, the bas-relief marble Phra Sila Buddha, believed to have been carved in Sri Lanka more than 1000 years ago. Located in attractive countryside about five kilometres south of Chiang Mai along the Ping River, Wiang Kum Kam is an ancient city dating back to the eighth-century Haripunchai Kingdom. Expect to see many interesting items and structures such as stone tablets with Mon inscriptions, Buddhist sculptures and architecture, earthenware and pottery. Taking a horse-led carriage is a popular way to enjoy the ruins. Chiang Mai Night Safari features three animal zones – Savanna Safari, Predator Prowl, Jaguar Trail – which you can tour via an open-sided tram or on foot. Enjoy a range of activities designed to keep you entertained throughout your visit, from hand-feeding wild animals and petting tiger cubs to a laser light show and ‘dancing’ fountain.